It happens to the best of us, and to the best of lawn mowers: Suddenly, your most important landscaping sidekick experiences a slight setback. Regular lawn mower maintenance helps prevent problems, and lengthens the life of your lawn equipment. Even with plenty of TLC, normal wear and tear from hours of mowing the lawn increases the chances of hitting a glitch from time to time. But first a warning: Always refer to the operator’s manual before starting any maintenance project on your equipment. 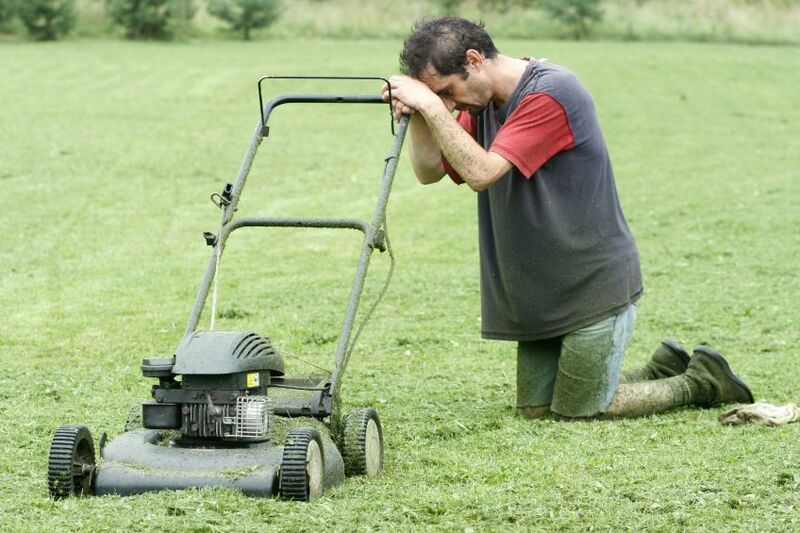 If all else fails, swallow your pride and take your lawnmower in for professional repair. I wasted 2 weeks and 50 dollars trying to “fix” something on the lawnmower that took the repair shop less than 10 minutes (and 40 dollars). • Dirty Air Filter: Clean or replace. • Fuel Not Reaching the Engine: Tap the side of the carburetor to help the flow of gas. If this doesn’t work, you might need a new fuel filter. • Build Up of Clippings & Debris: Clean underside of your lawn mower deck as noted above. Your spouse may make a big deal about it, but it’s usually not serious. Your lawn mower’s engine can smoke if your oil chamber is too full, or if oil leaked into the exhaust muffler when you tilted your mower to the side. It’s simply burning off while the engine is hot. But if you’re seeing lighter colored smoke, plus have trouble keeping your mower running, it’s time for a serious look by a professional.